Over the last five years we’ve been exploring the First World War impact on a small corner of the borough of Wandsworth. Summerstown182 in partnership with Big Up Films were awarded Heritage Lottery Funding in 2016. What followed was a wonderful twelve months, packed with events and activities which have really helped raise the profile of our community history project. Our funded period started last September with the unveiling of a plaque to Sidney Lewis and finished a year later with a ‘Summerstown Celebration’ where we showcased the work we’ve been doing with local schools and put up another historic plaque. The First World War centenary is over but the work goes on, promoting knowledge and awareness of local history with the wider community. Follow us on twitter @summerstown182 to keep updated on everything that’s happening! We worked extensively in the past year with Smallwood Primary and Burntwood School and engaged with a number of others. People saw some of this work at the Celebration event; three short films, a crafted timeline and a wonderful trail map, which will be very useful on our guided walks. We established a Friends of Summerstown182 history group and organised workshops demonstrating the filming and recording of oral history and genealogical and research skills. At one of our meetings the curator of ‘Far From the Western Front’ gave a talk about the South Asian contribution to the First World War. We were very proud to instigate the hosting of their exhibition throughout September at St George’s Hospital and supported it with two history walks. We expanded our knowledge through group visits to various archives, museums and exhibitions and such events as the installation of the African and Caribbean War Memorial and Chattri Memorial Day. We continue to engage with everyone in our community and are dedicated to increase understanding and awareness of this period. We broadened our existing Summerstown182 Walk to highlight the role of women and the industrial heritage of this area, including the role of the local hospital and River Wandle. We organised two library-based military history roadshows to help people learn about their family’s role in the war. We contributed extensively to the Wandsworth Heritage Festival and the centenary events around a local Victoria Cross winner, Corporal Edward Foster. Talks have been given to Wandsworth MIND, Lycée Français Charles de Gaulle, Wandsworth U3A, the National Audit Office, the Western Front Association, Wandsworth Historical Society, Earlsfield Business Network and Tara Arts. We participated in community events such as Hazelfest, Tootopia and Broadwater Road Fun Day and showcased our work at Merton Heritage Discovery Day and the Lambeth Local History Fair. We organised a very successful riverside walk as part of the Wandle Fortnight. We promoted the LSE’s Charles Booth map initiative through our Waterloo Sunset guided walks. We have organised trips for Friends to visit the battlefields and memorials in Belgium and France, actively participating in a number of ceremonies there. We memorably laid a tribute at The Indian Memorial on behalf of the Tooting Sikh Community. On a beautiful March afternoon, one hundred years after his death we held a ‘Remembrance’ in Streatham Cemetery for a ‘forgotten soldier’ buried in an unmarked grave. Two of our guided walks ‘Historic Earlsfield’ and ‘The Industry of Garratt Lane’ have contributed funds to put up a plaque commemorating a Victorian running track. The unveiling of this was part of the Summerstown Celebration. But there is still lots to do and we will carry on telling the stories of the Summerstown182, through our walks, talks and meetings until the end of the commemoration period in November 2018. We’ve now written over 160 of these so make sure you read them all by checking the Roll of Honour. If you live locally or not too far away, we would love you to be a ‘Friend of the Summerstown182’ and attend our quarterly meetings, trips or walks. The next meeting will be at 730pm on Tuesday 23rd January in St Mary’s Church Hall (entrance from Wimbledon Road). We have a regular programme of events, walks and talks – have a look at the list above to see what’s coming up. We are currently organising activities to highlight the much overlooked contribution of Indian soldiers in the First World War and the role played by those from the Caribbean. We have a special connection with Firozpur in the Punjab region and will be developing that over the coming months. Our latest walk was ‘The Greatest Tooting Tour in History’ part of the annual Tootopia Festival. We will be reviving our popular Summerstown182 Walk on Saturday 11th November for Remembrance weekend. On this very special walk, we intend to leave candles at the homes of the Summerstown182, to be lit in their memory. On Saturday 2nd December we are back in Tooting for the Tootopia ‘Tootmas’ Weekend ‘Walking in a Tooting Wonderland’. This starts at the Edward VII statue in front of Tooting Broadway station at 2pm. We have two further walks lined up in the new year including one on the River Wandle on Saturday 24th February. Many of the Summerstown182 would have grown up hearing stories about Robert Sadler’s extraordinary Copenhagen Running Grounds which were located off Garratt Lane between 1853 and 1864. Contemporary knowledge of this was practically non-existent until local historian Kevin Kelly wrote a book about it a few years ago. We publicised this remarkable story on 16th September by placing a plaque at the site, opposite Tesco, near the junction of Garratt Lane and Burmester Road. Descendants of Robert Sadler unveiled the plaque at a memorable ceremony. Funds have been raised to pay for this through two Guided Walks, both were part of the Wandsworth Heritage Festival. Many thanks to everyone who supported us. Look out for details coming up very soon about our exciting plans for more historic plaques in 2018. Summerstown is an historic area between Earlsfield and Tooting in south west London, close to the River Wandle and sandwiched between Wimbledon Stadium and Burntwood School. On this site, over the next two years, as we commemorate the centenary of the First World War, we will attempt to build a picture of this much-changed community as it stood one hundred years ago. This will be through the stories of 182 men whose names are inscribed on the 1914-18 war memorial in St Mary’s Church on Wimbledon Road. We have promoted it on the streets, through a popular guided walk which goes past many of their homes and key locations. Have a look at the map where they lived and see if any came from your road – a poppy marks the home of each soldier or sailor and most of them are just five minutes walk from the church. There are now 168 of them on the map. In three years we have identified a connection with this area for 179 of them, only three remain unidentified. Scroll down the Roll of Honour and see if you recognise any names. Beneath the names and personal details are links to the stories that have been written so far, of their lives and deaths and of the effect their loss had on this neighbourhood. Over this four year commemoration period, we are dedicated to researching and writing something about each of them. One local soldier who did come home, was thirteen year old Sidney Lewis from Defoe Road, Tooting who a few years ago was recognised by The Imperial War Museum as the youngest British soldier known to have served in the First World War. We wanted to publicly acknowledge this incredible story and organised a campaign called ‘A Quid For Sid’ to raise money to place a plaque on his old home. Due to the outstanding generosity of local people this was achieved in a very short time and on Saturday 24th September, Sidney’s son Colin unveiled it for us on what was an extraordinary and very special day. Last year a similar initiative resulted in Wandsworth Council placing a Green Heritage Plaque at the site of a Second World War V2 incident in nearby Hazelhurst Road. If you would like to get involved in this project, help with some research or can add something to the knowledge we’ve already discovered, it would be great to hear from you. We have been in touch with quite a number of relatives and new information is constantly emerging. We have also established contacts in Germany, Belgium, Turkey and Australia. Significantly we have discovered that at least two of our men, discharged from the army through illness are buried locally in unmarked graves and their miltary service has no formal recognition. We are very pleased that recently this has been rectified for one of them, Arthur Mace, who lived on Thurso Street. We are always keen to raise awareness of the project and more than happy to talk to schools, workplaces or community groups about it. We recently collaborated with Ernest Bevin College as part of their submission to BBC School Report and were thrilled at how engaged the young people were. Have a look below at the brilliant short film they made. 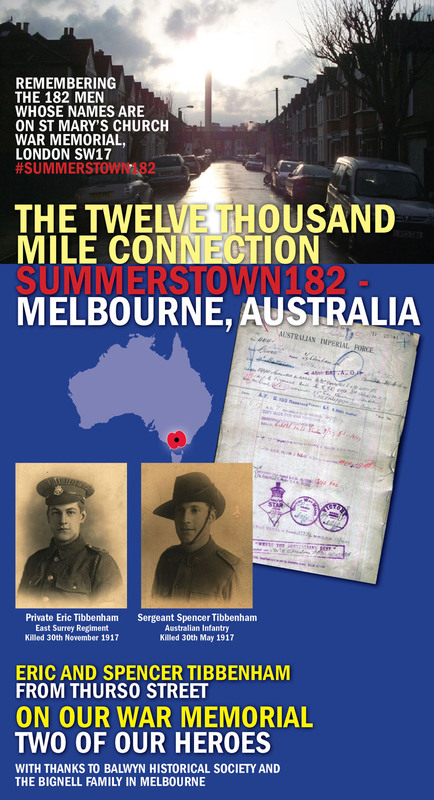 We also worked on an extensive project with Burntwood School which saw Year 9 students learn about and contribute to communicating the First World War history of this area through creating digital outputs and artworking a beautiful Summerstown182 timeline. Smallwood Primary School did a First World War trail of the streets around their school and helped put together a map of the route. 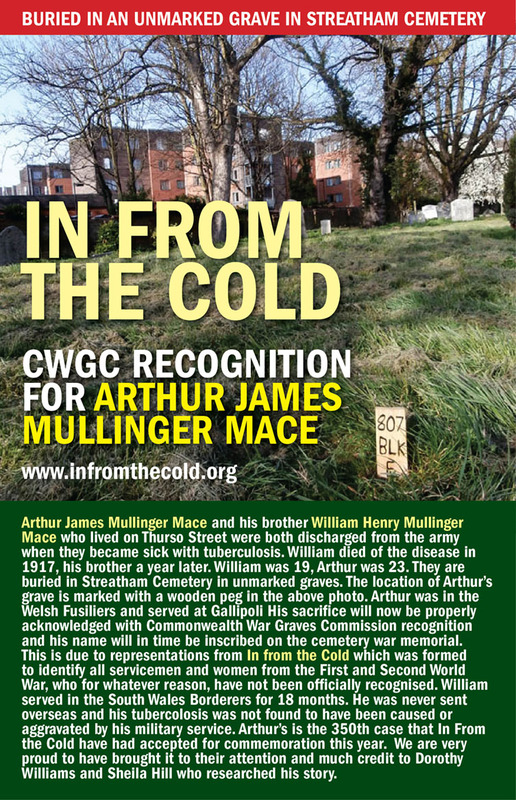 They were also heavily involved in creating artwork for our ‘Remembrance’ of a ‘forgotten’ Tooting soldier William Mace and participated in the memorable and moving ceremony we had for him in Streatham Cemetery. Geoff Simmons is the Heritage Coordinator and founder of this project and can be contacted at rgbsimmons182@gmail.com.